Even though the day started out a bit damp and dreary, we still managed to have a great time. 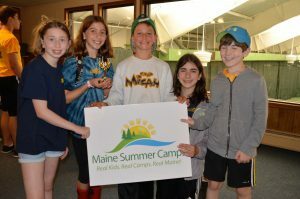 After breakfast, 10 excited campers set out for Portland, Maine and the 13th Annual Maine Summer Camps Spelling Bee. Our 15U and 12U teams, along with their coaches, practiced their skills for the hour long drive. They had their game faces on as they entered the arena. After some spelling warm up exercises, they were mentally limber and ready to tackle any word thrown their way. 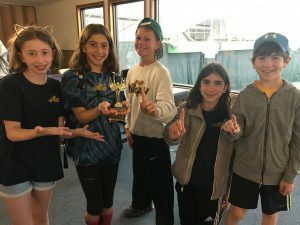 The preparation proved effective for our 12U team, who came away with the first place title and a trophy to add to our overflowing mantle over the Dining Hall fireplace. 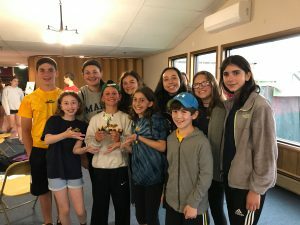 The 15U team, sadly, did not make the finals but cheered on our brilliant younger spellers. 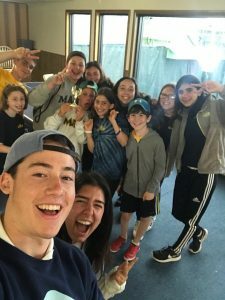 After dinner, the entire camp made their way down to Uncle Milt’s Performing Arts Center to watch the first session Talent Show. Choreographed dances, rubix cube solving, and musical performances entertained the masses. The night ended with a Summit & CIT band that played some rock and roll…Mark is checking with their agent to see if they are available for Saturday morning’s weekly jazz brunch.